Bush's speech, which the Guardian UK wryly observed was tagged in advance by the White House as "historic," provided little of the promised coherence, or elevation of the debate. David Brooks, Senior Editor of the Weekly Standard appearing on The News Hour with Jim Lehrer remarked that the American people were more sophisticated than the speech, and that " we don't need to be rallied." The centerpiece seemed to be a call for a volunteer civil defense organization. To coordinate our efforts we've created the new office of homeland security. Its director, my good friend and former governor, Tom Ridge, reports directly to me and works with all our federal agencies, state and local governments and the private sector, on a national strategy to strengthen our homeland protections. Thousands of law enforcement officials are aggressively investigating this bioterrorism attack. And public health officials are distributing the most accurate, up-to-date information we have to medical professionals and to the public. We take each threat seriously. And when we have evidence of credible threats we will issue appropriate alerts. and lack of progress in the war in Afghanistan, combined with reports of civilian casualties. Our military is pursuing its mission. We are destroying training camps, disrupting communications and dismantling air defenses. We are now bombing Taliban front lines. We are deliberately and systematically hunting down these murderers. And we will bring them to justice. Throughout this battle we adhere to our values. Unlike our enemy, we respect life. We do not target innocent civilians. We care for the innocent people of Afghanistan. With Bush's personal popularity still in the neighborhood of 90%, and public approval of the administration's response to terrorism in the 75 - 85% range, why did the administration feel the need for a pep rally? One answer, according to the Times, is administration "displeasure as newspapers and evening television shows have highlighted how some officials have contradicted each other." Despite high overall approval numbers, this concern was reflected in recent polls which showed a decline of 6% since mid-October in public confidence in government's ability to handle a major outbreak of anthrax. The decline may reflect inconsistent administration statements concerning anthrax, having initially sought to assure the public that the mail was safe, then modifying their position to warn that spores could seep through almost any envelope. In a now-famous faux pas, when the first anthrax case was discovered in Florida, Health and Human Services Secretary Tommy Thompson implied in a White House news conference that the man dying from the disease had contracted it from drinking stream water. That comment, and his assertion that the government was prepared for "any kind of bioterrorism attack" led critics to characterize Thompson as being "too eager to reassure the country at the expense of credibility." With no single office coordinating medical and legal responses to the anthrax crisis, federal agencies clashed with local authorities, criminal investigations and health testing were delayed, and public panic and confusion exacerbated. The Office of Homeland Security, which is supposed to coordinate, lacks staff, budget, and authority. The Centers for Disease Control and Prevention as they sought to reduce health hazards seemed to come into conflict with the Federal Bureau of Investigation's efforts to investigate the matter. Responding to questions from the Senate Governmental Affairs Committee at a hearing on October 18, Health and Human Services Secretary Tommy Thompson admitted that no single person was in charge of coordinating preparation or response to a chemical or biological attack. Mr. Thompson went on to say that his agency was "giving out as much information as we possibly can." This was disputed by scientists in his department who told the New York Times that they had been prohibited from talking to journalists, and suggested that this had contributed to misinformation and increased public anxiety. Former president Clinton issued a directive in 1998, defining responsibilities of government agencies concerning terrorist attacks. Although the Bush administration claims it is "building on those directives," confusion and disagreement were evident last week. Emergency management agency general counsel Michael D. Brown said, "The F.B.I. is always the lead agency for crisis management. FEMA is always the lead agency for consequence management." Secretary Thompson apparently disagreed, telling the senate committee, that his department was "the lead federal agency for the public health response to any biological or chemical attack." Director of the Office of Homeland Security, former Pennsylvania Governor Tom Ridge, took a turn trying to assure Congress and the nation that the administration was responding in a coordinated way to terrorism real and threatened. Like Thompson, however, his statements conflicted with reality. Ridge claimed that federal, state, and local authorities "have worked so well together" since the September 11 attacks. Unfortunately his statement followed reports of disagreements between the FBI and New York City officials over the scope of the investigation at the offices of ABC News, where a 7-month old baby was infected with anthrax. During Ridge's news conference on October 19, Attorney General Ashcroft repeated a promise to crack down on anthrax hoaxes, FBI Director Mueller would not say anything about leads in the investigation of the anthrax attacks, and health officials were unable to clarify conflicting statements about the relative potency of anthrax delivered to the office of Senate Majority Leader Tom Daschle. "When you turn on CNN, you get a lot more than you do from these jerks," Senator John McCain complained, referring to the lack of credible information coming from the administration. "I've never gone to one of these briefings where I couldn't turn on a TV or pick up a newspaper and get much better information." Perhaps because no one else was doing so, members of the administration began praising each other. "They're doing a good job of identifying cases that might be anthrax," Thompson said of the Centers for Disease Control. Chief of Staff Andrew Card added, "We have outstanding health care experts that understand this problem and are addressing it quickly." -- This despite CDC assurances to postal workers that protective clothing or testing were unnecessary, after which two postal workers died from anthrax. And the praise was not confined to domestic players. "I've got great confidence in the American military," Bush has said on more than one occasion. CNN commentator Bill Press asked rhetorically, "If the military's doing such a great job, why -- after three weeks of nonstop, intensive bombing of one of the poorest countries on earth, with no navy, no air force and only a ragtag band of soldiers using obsolete weapons -- is the Taliban still in power? Why do they still control every major city in Afghanistan? What's left to bomb? And why are Osama bin Laden's whereabouts still unknown?" Spokesman Ari Fleischer maintained that the coherence initiative did not reflect dissatisfaction with various members of the administration. Invoking a phrase used by the administration when it first took office, an administration official told the Times that having Bush address the nation would "elevate the debate." It seems more likely that the speeches are an effort to counter a press corps which, after initially supporting the administration's management of the September 1l crisis and its military campaign, has recently gotten tougher. After asking head of the Office of Homeland Security some tough questions last week, NBC News reporter Campbell Brown reported having received a chiding phone call from a "senior administration official." Brown observed, "To get an unsolicited phone call from a senior official at this White House is very unusual." At the same time, popular support for the administration effort around the world, after an initial surge of solidarity, has begun to waver. Observing the Day of the Dead in Mexico on November 7, some participants, while expressing sympathy for victims of the September 11 terrorist attacks, made it clear that did not equate to support for the U.S. war in Afghanistan. One organizer of a traditional celebration said, "I think the government of President Bush has gone too far; the war frightens me." The Washington Post reported similar sentiments throughout Africa, Asia, and Latin America, where horror at the September 11 attacks was not seen to justify the bombing of Afghanistan. Many disputed Bush's simplistic characterization of the war as a battle between good and evil. For example, a recent poll in France showed support for the U.S. military action declining from 66% on October 7 to 51%. In Germany recently 65% of those polled supported an end to U.S. attacks on Afghanistan, as did 69% in Spain. In China the government officially supports U.S. military action, but reports of the effects of bombing seems to have eroded popular support. As a young Chinese told the Post "I think the United States has been too harsh and unreasonable. It's big and powerful, and it doesn't care how others feel. You can't behave like that. Isn't that why America was attacked?" Afghan refugees in Pakistan responded similarly. "Before the bombing, the Taliban was always saying that Americans were enemies of Muslims and of Islam, and we did not believe that," Sardar Bibi Khan, a farmer from southern Afghanistan told the Los Angeles Times. Civilians killed as the result of U.S. military action changed his mind. Now, "we believe that what the Taliban was saying about America is true: They are trying to kill Muslims and finish Islam." Despite wanting to see the Taliban overthrown, Afghans are now more likely to see the Taliban, like themselves, as "victims of global politics beyond their control." Some observers see this shift in attitude as evidence that the international coalition risks "driving Afghan civilians into the arms of the Taliban." "When there is bombing in people's villages, of course they are not happy," said Abdul Sattar, an Afghan living in Pakistan who runs an organization that removes land mines in Afghanistan. "We are the victims of Washington and New York's World Trade Center [disasters] just as we were the victims of the Cold War. We are a Third World country, we have very little education, but still we have our own way of life. We have had our own government, we are not terrorists [and], if it were up to us, as Afghans, we would ask all non-Afghans to get out of the country, all of them, and leave us alone." Closer to home, a Mexican popular song criticizes the CIA's role in creating the specter of Osama bin Laden: "They are looking for you, bin Laden, the terrorist that the CIA trained, that was the biggest mistake of the American government." A Mexican labor leader observed, "It's clearly not a war between good and evil. The impression is that there are other motives behind the war. It's not just hunting down the terrorists, but achieving greater control in a strategic area with rich resources, and the possibility of exploiting oil and minerals." 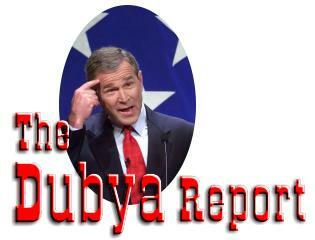 Asked last week about the progress of the war, Bush said "we're making good progress." In reality the Taliban was proving to be a much tougher opponent than had been foreseen, and anticipated mass defections had not materialized. More than one observer was reminded of the dubious excuses trotted out to explain Bush's shuttling around the country in Air Force One on September 11, only to admit later that there had been no credible threat and that the initially proffered excuse was false. More recently, Gen. Richard Myers described a raid by the Army Rangers and a squad of the Delta Force on October 20, saying the forces "were able to deploy, maneuver and operate inside Afghanistan without significant interference from Taliban forces." Seymour Hersh, writing in the New Yorker, describes the raid as essentially a public relations effort. According to Hersh, the U.S. forces parachuted onto a Taliban airfield "only after it was determined that the enemy was gone." It is ironic that even in an initiative that has as its primary objective the shaping of appearances -- in this case the appearance of a coherent approach toward preparation for and response to terrorism, and the communication of information about those activities -- the administration cannot reconcile its rhetoric with reality. Parts of the Bush speech were clearly misleading, as when Bush called on Congress to send him legislation that "puts the federal government in charge of all airport screening and security," while his administration has actively lobbied against the measure passed unanimously by the Senate, which federalizes airport security workers. Moreover, Bush reportedly promised Republican leaders this week that he would veto any spending beyond the $7.7 billion his budget advisers say has been designated for homeland security. This is remarkable given bipartisan support for programs such as increased production of smallpox vaccine, additional funding for local public safety agencies, and improved security at borders, mass transit, nuclear plants, and other "sensitive parts of infrastructure." As the editorial writers of the New York Times commented recently, "Americans would have more reason to be sanguine if there were more of an aggressive effort to bring coherence to the management of homeland issues and not just to the discussion of them."